I have a bunch of Hourglass cosmetics. I love their Ambient Lighting Blushes, Ambient Lighting Powders and on the fence (well more like majorly on the fence) about their Modernist Eyeshadow Palettes. I have yet to try out their bronzers. However, that is coming soon! So when Hourglass came out with their Ambient Strobe Lighting Powders, I was intrigued on trying them because I really wanted to know what the difference would be between their ambient lighting powders and their ambient strobe powders. 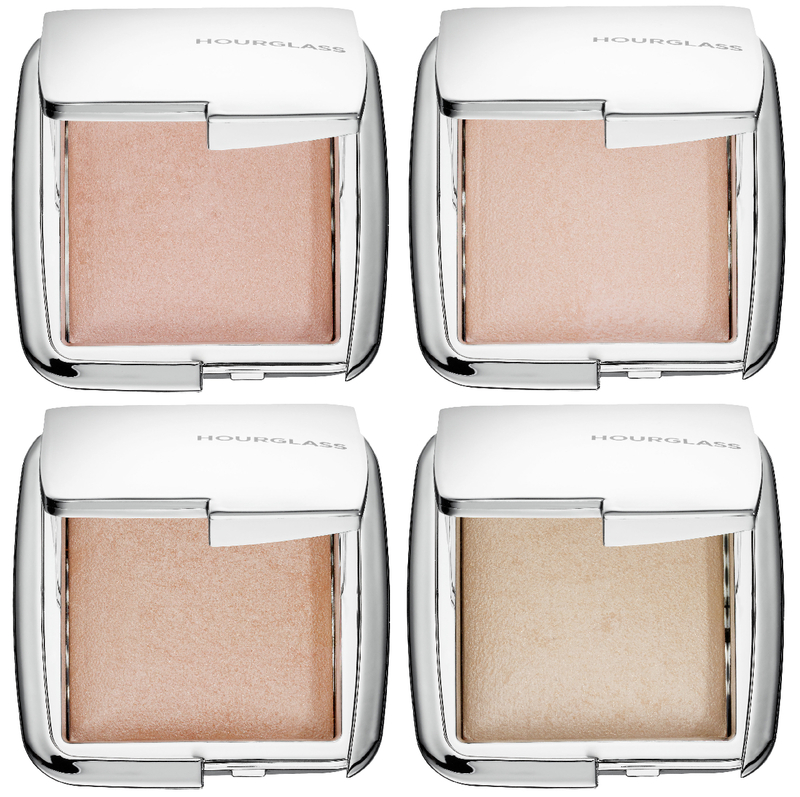 Hourglass came out with four Strobe Lighting Powders. Two which had already been previously released. Their incandescent strobe powder was released in their Ambient Lighting Powder Palette that came out during Christmas 2014. And their iridescent strobe powder was released in their Edit palette for Christmas 2015. I currently own their incandescent strobe powder because I bought the lighting powder palette when it first came out. So I wanted to try out their other three colors to see if they were similar or the same to the ambient lighting powders. These strobe powders claim to be strictly highlighters. Yet there is where my confusion came in. I thought that the Ambient Lighting powders were highlighters all along! However ones thing for sure, with the ambient lighting powders, you can also use them as setting powders for that soft glow candle light effect. I quickly learned that if you use these strobe powders as setting powders, you will have a strong disco like effect going on. There are four colors in the ambient strobe lighting powders series. Brilliant is literally a brilliance highlighter that is a light shimmery gold. It really does leave a lustrous effect on the cheeks without looking like a disco ball. 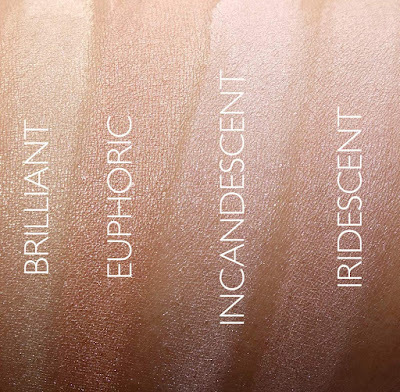 Euphoric is beige in tone with a peach undertone which comes across as a neutral highlighter in a pearlescent kind of way. This highlighter is the darkest in tone amongst the four of them. 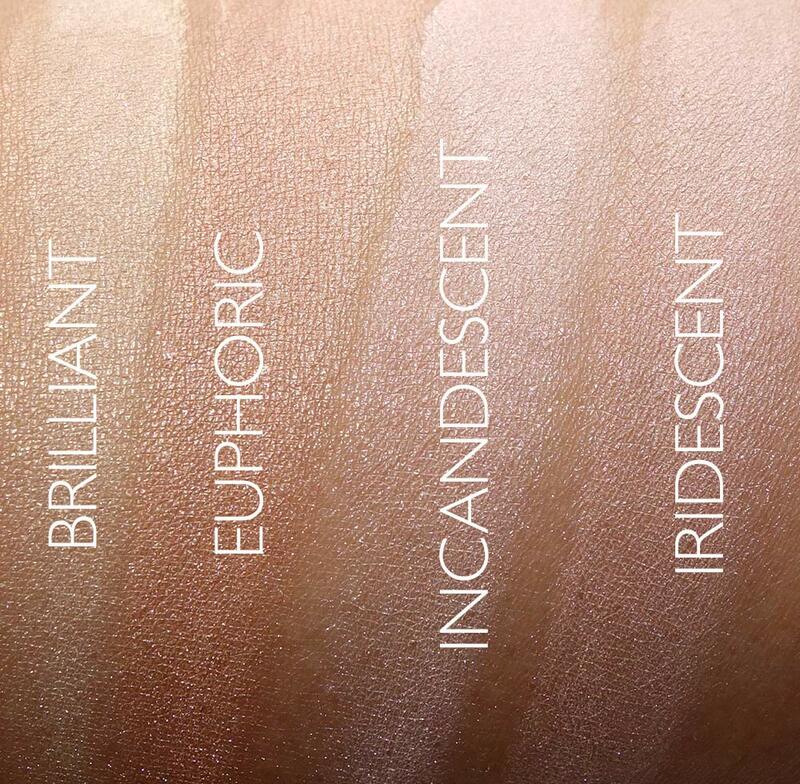 Incandescent is a opalescent pearl powder that is still in the pink range but is lighter then iridescent. It is very celestial when applied to the skin and gives off a nice natural looking glow. Iridescent is a pink powder that is darker than incandescent but still gives off a soft highlight without coming across too dark. It is a very illuminating color. As a gift, my husband went out and bought me the brilliant ambient strobe powder. I was totally psyched when I received this as it showed just how well he knows me. These strobe powders come in a beautiful silver case. The cases are the normal standard cases with a mirror on one end and the powder at the other. The cases are their usual mirror like finish but in a silver color. You will get finger marks on these just like their other bronze, gold and yellow finishes. These strobe powders are finely milled with little fallout and pick up great when used with a brush. Hourglass is selling an Ambient Strobe Light Sculptor; basically a beauty blender like sponge that you can use to apply these highlighters with. Save your money and use whatever normal brush you use to apply your highlighter with. There is nothing really special about this "sponge" that a normal brush can't give you. I applied the brilliant strobe powder to the top of cheek bones, bridge and tip of my nose, forehead and sides of my cheeks like I normally do. The highlighter looked amazing. It blended in well, caught the light with a beautiful effect and didn't look obnoxious or as if someone threw a cold pail of water on my face. I didn't have any fallout out and the highlighter really stood out while not overpowering the rest of my makeup. The price on these highlighters are pricey but at least comparative (more or less) in their size to their other products. So while they do get cheaper depending on which product you buy based on the amount each product category contains, however the price really doesn't go down by much. You still will have to be willing to put out some hard dough if you want to get that candlelight glow affect all over your face. Many people ask me all the time, if these products, the ambient powders (in general) are worth the money?! I can tell you right now with confidence, hell yeah! While they may be priced stupidly high, however you do always get what you paid for and what you paid for is totally an amazing picture perfect makeup look all over your face. So while I hate spending so much money just for one item, however I can't deny it money well spent. I totally recommend these highlighters you if want something beautiful and not over the top. Have you tried any of the new strobe powders? Let me know down below!